As a teenager, in 1965, I remember an exciting summer day of meeting Ruth Billdt in a hallway at the Bethany Home for the elderly one afternoon to pick up her autographed book just hot off the press for my mother. It was a translation into English from the Swedish of her father's book which is noted below. Ruth Billdt was a good friend of my grandmother Nina Sohlberg Fry spending memorable times in Swedish Club together. Her parents were friends of Emil's and Lydia's, her father being their Pastor at Bethany Lutheran Church. This was a post he held for 38 years from 1904 to 1942, beginning at the unexpected death of the second pastor and founder of Bethany College, Rev. Dr. Carl Aaron Swensson. And, it was their church, the congregation of those times, which was most responsible for preserving Lindsborg and the Smoky Valley histories and Rev. Bergin was destined to be the key individual for putting into place a mechanism that was dedicated to gathering the histories of Lindsborg and the Smoky Valley to preserve them and to share them with as many as possible. Thus, in 1909, his first book was written in Swedish, and in 1919 his second book was also written in Swedish, at the same time that the Lindsborg Historical Society (today the Smoky Valley Historical Association) was organized, composed mostly of his church's members. Decades later, a daughter, Ruth Bergin Billdt, felt the call to translate her father's historical Swedish books into English, and a like-minded woman, historian writer Elizabeth Jaderborg, joined her as an editor, and later as a co-author, to help publish these two earliest fine books on Lindsborg and the Smoky Valley, the 1909 in 1965; and the 1919 in 1969. Since their modern English translations publications, they were to become the go-to sources for so many of the Smoky Valley writers when writing their books and articles. There are so very few of these books as they were sold individually to a small group of people in Lindsborg and the Smoky Valley. They were copyrighted, of course, but not registered with the Library of Congress Copyright Office in Washington, D.C. Bethany College has approximately four (4) copies according to an on-line source. Because neither of these books have a "Table of Contents," a loose listing of all "Headings" within each volume with the corresponding page number has been created in a pdf file to facilitate research projects for those who are interested in sharing this most interesting local history with others. The pdf file, Table of Contents, for each book is found just under "Headings." " Lindsborg, Bidrag Till Svenskarnas och Den Lutherska Kyrkans Historia i Smoky Hill River Dalen "
" Pioneer Swedish-American Culture in Central Kansas "
More than half a century has passed since the publication in 1909 of Dr. Alfred Bergin’s excellent history of Lindsborg and the Smoky Valley written in the Swedish language, but the chronicle of events and the basic material which he presented continue to fascinate and inspire a new generation. It is, therefore, singularly appropriate that this interesting volume should be made available in the English language. Mrs. Ruth Billdt a daughter of the author, has prepared this translation as a labor of love. Many people will be greatly indebted to her for revealing to them personally the rich treasure that is found in the following pages. The original volume of 350 pages of the printed word with almost 400 photographs and this translation record with sensitivity a series of events that had their origin in the religious, economic, and social life of Sweden in the middle years of the nineteenth century. Discouragement with the prospects in Sweden and the promise of new opportunities in America brought a steady stream of Swedish emigrants to these shores whose numbers exceeded more than a million in a century. This volume describes the joys and sorrows, the success and failure, the aspiration and disappointment of those who came to the Smoky Valley and the heritage that was transmitted to their children and to their children’s children. A later generation is indeed the grateful legatee of the energy, sacrifice, vision, and faith of the pioneer emigrants and their successors. Dr. Bergin completed his research and writing exactly forty years after the crucial year 1869 when the Reverend Olof Olsson of Sunnemo arrived in the future Lindsborg community with a large part of emigrants form Värmland. Dr. Bergin had already lived in Lindsborg and served as pastor of the Bethany Lutheran Church for almost five years prior to 1909 so that his identification with the pioneers was intimate. This volume profits immensely from the fact that he was able to secure valuable information from some of the participants in the story which he recounted. Moreover, the author brought to his assignment an inquiring mind and scholarly insight. His scholarly work, “the Law of the West Goths” which served as his dissertation for the doctor of philosophy degree at the University of Minnesota, is additional evidence of his qualifications for writing a fine history of Lindsborg. In addition to information received from interviews with the pioneers, the author made extensive use of documentary materials and written accounts by the emigrants and contemporary observers. Fortunately, the scholarly training of Dr. Bergin caused him to cite extensively from these sources. Included are liberal quotations from the minutes of The First Swedish Agricultural Company of McPherson County, Kansas, whose members promoted the settlement of Lindsborg, the minutes of the Bethany Lutheran Church and related organizations, and writings of contemporary observers like Ernst Skarstedt and Julius Lincoln. Such material provided the rich source which must always be the principle reliance of the historian who seeks to describe accurate past events. Although not generally documented, the materials are self-explanatory as to the source. Although history is far more than biography and the achievement of individuals, the role of the personal element is always meaningful. This volume portrays clearly the assets of personal leadership whether it be that of Dr. Olof Olsson, the founder of the community, or Dr. Carl Swensson, the founder of Bethany College, or that of other individuals who in various positions made significant contributions to the life of the community. But this historical account also provides unique resources in the portrayal of family histories, a continuing source of strength in community life. Although the role of leadership is given appropriate attention and evaluation, this is in a real sense the history of the people. Man lives not isolated as an individual nor exclusively in a family unit, but his life finds expression in relationships with a wide circle of friends and associates. This volume portrays this sense of community in a gratifying manner. Basic to the founding of Lindsborg was a land company, an interesting cooperative venture grounded firmly on evangelical Christian principles. The religious life of the people was based on the deep evangelical tradition of the läsare movement which found expression in the organization of the Bethany Lutheran Church in August, 1869, shortly after the arrival of Pastor Olof Olsson in Kansas. There were other manifestations of this sense of community, culminating in the founding of Bethany College in 1881. A central them in Lindsborg’s history has been religious interest and commitment. Although this volume, which was originally published under the auspices of the Bethany Lutheran Church, emphasizes the history of that congregation, the origin and growth of other churches and denominations is also recounted. One of the subtitles of Dr. Bergin’s volume emphasizes the fact that he sought to portray cultural history, and broadly speaking, the goal has been achieved. Included in an appropriate understand of culturing is the daily life of the people, the world of work and business as well as the institutions and efforts designed to promote religion, the arts, and that intimate sensitivity that in a more restricted sense is often related to culture. This volume also presents distinctive achievements in this area. Moreover, there was an interplay of other Swedish communities in Kansas with the settlement at Lindsborg, so this volume describes briefly the origin and development of those communities. Although the distinct aspects of Lindsborg’s history are related to the achievement of the Swedish emigrants and their descendents, the pattern of constructive development was shared wholeheartedly by enthusiastic persons whose antecedents were not Swedish. Many of them have made significant and abiding contributions to the life of the community as identified in the chronicle of events. Forty years [1869-1909] of community living, thinking, and believing are recorded in the pages which follow. These years constitute a precious prologue to a period which already exceeds it in length of years, and ahead are the challenging promises of more years and decades. The foundation was laid with faith and devotion so that an abiding structure could be built upon it. Another generation is now engaged in creating a pattern of life and destiny in the context of the past. May this excellent volume be received in a spirit of gratitude and appreciation for a precious legacy and may it also serve as a point of departure for renewal of interest in and rededication to the faith and vision of the pioneers. When a strong, young Swede leaves his fatherland, he seldom plans to stay away forever. Usually his plan is to better his financial stat and then return home. But if he begins to build a home he soon finds himself bound to this new home because of the worry and hard work. Children who are born here have another homeland than his, and he enjoys advantages such as he had never dreamed of in Sweden. An odd thing happens: he feels at home in this new country, but at the same time he retains his love for his fatherland. In the larger cities, our people disappear among the masses. In the newly homesteaded rural areas there are so many different nationalities that, because of the natural Swedish aloofness and fear of ridicule, others become predominant, and the Swedish influence becomes hidden and pushed aside. Therefore, in such places, it is difficult to get a picture or history of the Swedish people and their culture. However, here and there are settlements that are almost exclusively settled by Swedish people. One of these communities lies in the Smoky Hill River Valley in Kansas, with its center at Lindsborg. It is our plan to describe the beginnings and development of this community of 12,000 Swedish people as realistically as possible. We will try to present to the historians and other interested persons a true picture of the Swedish-American culture; to tell our brothers and sisters in our beloved homeland about our achievements in this new world. But our main desire is to leave to our children and future generations the story of the hardships, courage, and strength of those who first settled here on this wild and wide prairie, and to present an honest picture of the preservation of our religious freedom and the building of our churches and schools, so that there may be continued respect and love for those things striven for and accomplished by their forefathers. This type of work presents many questions. For example: Is this ground, secured through hard labor as truly Swedish as that inherited or acquired through bloodshed and the sword? Perhaps such an account as this is almost as important as that of an explorer who realizes that he is dying in a strange land. Hastily, he writes about his experiences in the hope that they may benefit others who will follow in days to come. Would it have been more beneficial to the people and the nation if Sweden would never have suffered the depletion of manpower that establish Swedish America? Or has God a great plan by which Swedish America shall be the rescuing angel to encourage a renewed energy in an apathetic and exhausted race of Northmen, and to inspire a new vitality, which will once again place Sweden among the foremost nations of the world? The future holds the answer. Material for this book has been gathered from word-of-month information, reports of the land companies, records in the churches and education institutions, the Kansas Historical Society’s “History of Kansas,” “The Santa Fe Trail” by Col. Ingman, “History of Kansas Synod” by Ott, Conference and Synod records, as well as old and more recent letters. It stands to reason that much color has been excluded because the people involved are still with us. We have used words that may sound odd to the people in Sweden so that we may be understood by the Swedish Americans. It is not our intentions to place a bouquet of flowers in the reader’s hands, but to portray a true picture of the Swedish culture in central America. Articles contributed by others have been properly recognized, the author’s name having been placed at the end of each article.
" Lindsborg Efter Femtio Ӓr "
" The Smoky Valley in The After Years "
Note that Part One: After Fifty Years is where the translation is found. 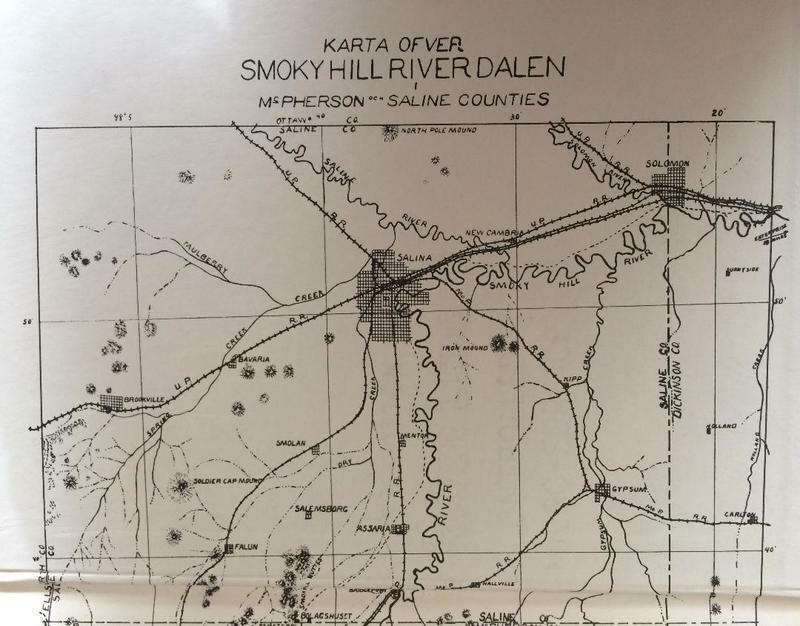 Part Two: From the Files come directly for the compilation of such files by Elizabeth Jaderborg, Secretary of the Smoky Valley Historical Association, Lindsborg, Kansas. If our culture is to survive, somewhere there must be a meeting place for the minds of the generations. Such a place can be found in this volume. In “Part One: After Fifty Years,” Ruth Billdt’s translation of Lindsborg Efter Femtio Ӓr by Dr. Alfred Bergin (1919), we find selections written by men and women who lived through a period which included both the frustrating pioneer days and the years of the first World War. In this spastic era, some of them were struggling in America’s upheaval caused by the Civil War. At the same time, others were engaged in a tremendous Westward Expansion. These people witnessed the turn of a century and the pains of recessions which accompanied it; they were drenched by the passions and purges which only wars and the subsequent derangement of population can produce. The effect of this forced association with “Americana” ultimately brought sophistication to the immigrant populations of the frontier. The Swedish language used in the original book by Dr. Bergin – Lindsborg Efter Femtio Ӓr (1919) – is a bit less traditional than that used in his earlier history of Lindsborg. * Here and there, “Americanisms” can be found. In some cases translation was nearly impossible, and the editing was extensive. How much of this was due to a conscious effort to adapt to the new environment and how much crept in unintentionally, one cannot determine. Certainly there is evidence of both. There was an obvious attempt at eloquence in some cases which does not appear in any appreciable way in Dr. Bergin’s first history of Lindsborg. We find, however, the same charming revelation of pietistic thinking and “church-mindedness” here. There is little to suggest the unrest and the change in character and ethnic concepts which have occurred in the second fifty years in the Smoky Valley, though a definite note of anxiety can be heard. Here we have the reflections and memories of men who now had time to reflect and remember. We sense more of the abstract, and less of the facts and figures and genealogies. There is a deliberate frankness which, if it had been strictly adhered to in the translation, might have been considered by some as less than discreet. These portions were softened by twists of phrases. In this volume, we find more of the story of the struggle over language. From our vantage point we can see that a very real conflict was in progress which would effect the immigrant communities and churches for generations. Indeed, we recognize that in some instances, issues and struggles lost their identity, leaving only traditional feuds and shadowy irritations. Progress has sometimes been the victim; provincialism has sometimes been the victor. So it was then: so it is today. The advantages of making available an English translation of material such as that in Dr. Bergin’s works should be obvious. In another generation there will be practically no one in Lindsborg, Kansas who will be able to read them in Swedish. 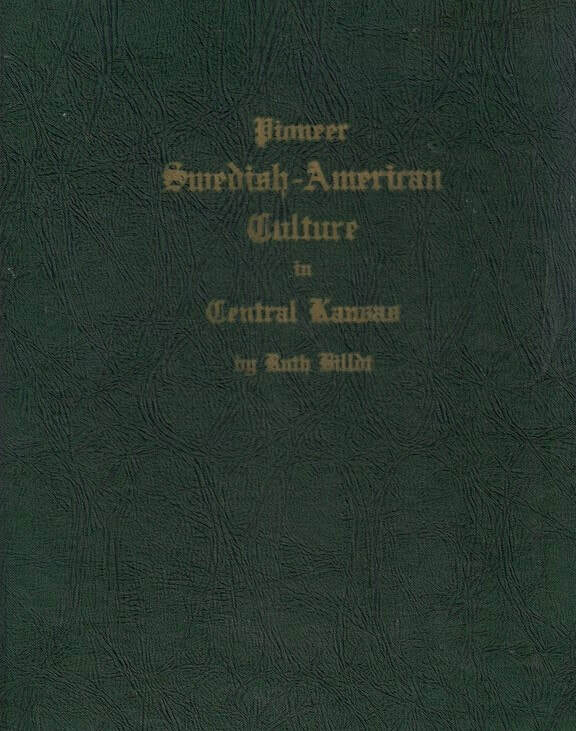 The impact of having the first volume translated and in print ([Pioneer] Swedish-American Culture in Central Kansas by Ruth Billdt: Lindsborg News-Record, 1965), making it available to the younger generation, has already been felt. Shown their heritage in a language they understand, school children are eager to learn more. They are doing their own research. This has happened before in the area. Some of these refreshingly candid accounts have been included in: “Part Two: From the Files.” These contributions are no less authentic than those written a half century ago; in fact, in some cases long essays have had to be trimmed of detailed descriptions and pertinent historical information to accommodate the limited space of this section. Unabridged copies of these projects are on file in the archives of the Smoky Valley Historical Association in Lindsborg. Young people have a vigor and potential that often goes untapped. But when there is cooperation between the generations, matters move. Age is forgotten: respect is completed and mutual. It is then that things happen; things such as relentless curiosities poking into archives, and strong hands rebuilding dugouts. Special mention should be given here to others who have helped to make communication between generations possible in “The Smoky Valley in the After Years:” “Posten” Peterson (Bethany Printing Co.), J. A. Udden, Ernst Pihlblad, Carl O. Lincoln, Anna Carlson, G. N. Malm, Alma Luise Olson, Elmer Ahlstedt, E. B. Brubaker, Elmer T. Peterson, H. K. Bruce, Birger Sandzén, P. H. Pearson, Emil O. Deere, Anton Peterson, Kirke Mechem, Emory Lindquist, Malcolm Esping, Chester C. Bruce, C. R. Peterson, Alba Malm, Selma Lind, J. J. Walters, June Currier Holmes, L. E. Lindell, T. S. Anderson. Lindsborg is one of the youngest Swedish settlements in America. Vasa (Minnesota), New Sweden, (Iowa), Andover, (Illinois), Sugar Grove, (Pennsylvania) are much older, not to mention Delaware Colony, the oldest Swedish settlement in our land. Our community has been in existence for fifty years and for us that is a long time. We have persuaded several people to contribute to this work. This will make the picture clearer and more dependable than if only one person were to express his feelings and opinions. Peoples’ conceptions of the same things or events are quite different. It is easy to misplace the events, to remember that which is advantageous to oneself, or to record situations which may be disadvantageous to another person. Too, there are those who delight in withholding the truth from those who earnestly try to advance the truth. It is always easier to make the right side more prominent than the dark side. This is a characteristic of all historical records, much more so when contemporary conditions are depicted. Our community has many failings as does every community. So if love for one’s country and friends keep one from disclosing certain events, please do not judge too harshly. That which is disclosed becomes public, giving those who are alive an opportunity to fill in that which they feel is lacking. Because the congregations of Fremont and Salemsborg were organized the same year as ours, we give our sister communities representation in this JUBILEE history. Shorter accounts from our whole conference are included because our community has been in intimate relations with every congregation in the conference. This way the reader is given a complete picture of the work of the church and the life of our countrymen in the southwest. If anyone feels we are boasting too much, our answer is that we do not want to make ourselves appear important, but wish to show that we are worthy to dwell among good friends and trusted neighbors. The distressing conditions in our world lie heavily upon all. One can sense it in this history. We hope that which has been gathered here will in some way reveal what our people have experienced during the past fifty years in this part of the country, when the “Great American Desert” was changed into a blooming and fertile garden. We wish to express our sincere thanks to all those who have contributed in the preservation of the Swedish Lutheran church in this part of the country. Surely someone among our descendants will testify that we have done what we could to preserve for the future the memories of the pioneer period. May the future history far surpass that of the pioneers in every way. May the contributions which the pioneers gave to this nation help to hold the Star Spangled Banner high among the standards that wave over the world’s free nations. 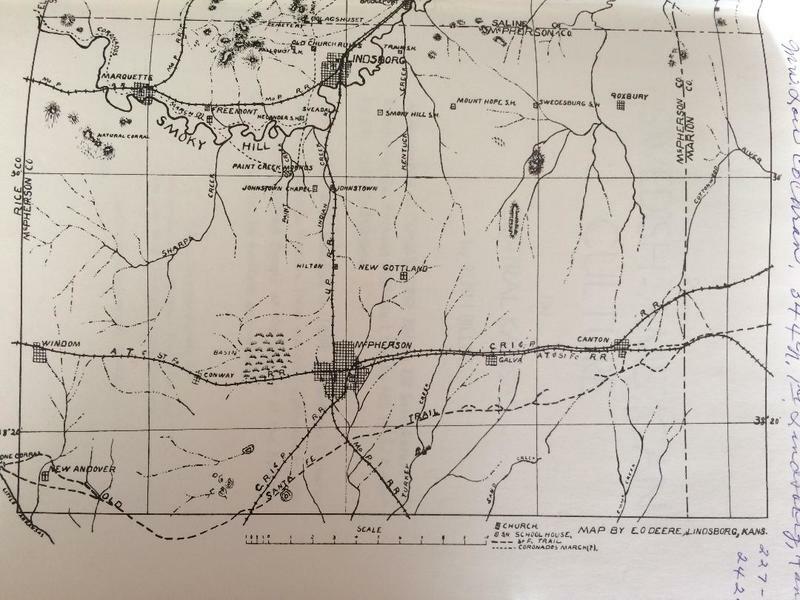 At the same time the congregation invited the Augustana Synod to hold its annual meeting here in 1919, it also decided to publish a more complete history of this settlement. At a later meeting of the church board it authorized the pastor to carry out this work. This pleasant task he has tried to do. It has been done knowing that in all probability this may be the last history concerning the vicissitudes and fortunes of our people and our church in the American southwest that will be written in the language of the pioneers’ fatherland. Copyright © 2019 www.swedesthewaytheywere.org. All rights reserved.